Sample of mycelium, the vegetative part of fungi, that could one day help clean up the Spokane River. While doing outreach work for the Lands Council, a local environmental nonprofit, Heidi Montez spent a lot of time on the banks of the Spokane River telling fishermen, swimmers and boaters about polychlorinated biphenyls (PCBs), toxic chemical compounds that cities spend millions of dollars trying to purge from waterways, and how to avoid them. All this talk about PCBs got Montez wanting to know more about the chemicals that build up in fish and people and are linked to cancer and other serious illness. "I started learning what [PCBs] are and how they behave in the environment," she recalls. "And then I started finding all these scientific articles on how fungi can break them down." Montez started talking to her boss at the Lands Council about what she found. Those conversations eventually led to a $30,000 contract with the city of Spokane for the nonprofit to look into an unusual solution for the persistent pollution problem: mushrooms. Now the project lead for the contract, Montez stands outside of a red-brick warehouse where work is wrapping up on a laboratory where she will conduct experiments. 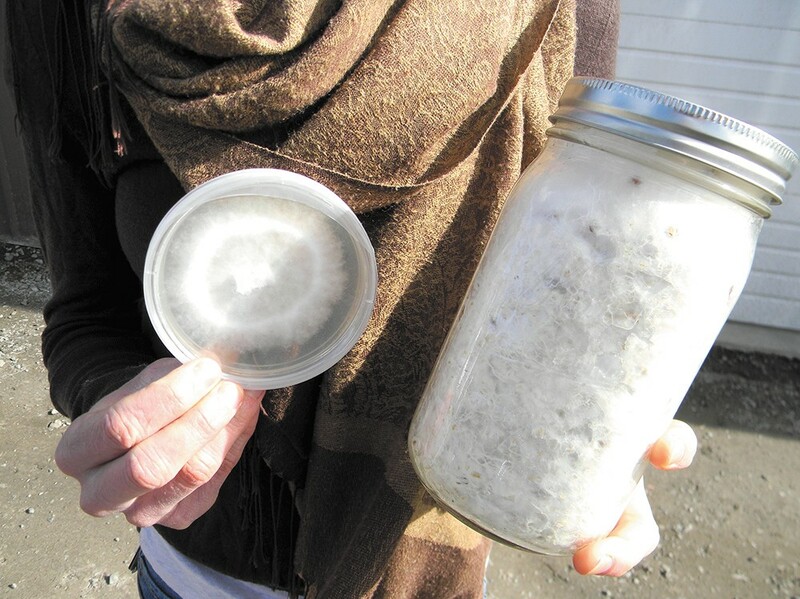 Her arms are full of Mason jars and petri dishes that are snow-white with mycelium, the vegetative part of fungi, from oyster and turkey tail mushrooms, as well as other species that have shown promise in destroying PCBs. "One of the most important ecological niches of a lot of mushrooms is to break things down [like trees and other organic matter] and basically compost them and turn it into soil," says Montez. "So the way these mushrooms digest things gives them the ability to digest chemicals." PCBs were once used widely for industrial purposes such as transformers, coolants and hydraulics. They were banned by Congress in 1979, but still can be found in the environment. They're also inadvertently produced in the manufacturing process for products like ink pigments used on yellow traffic lines. When it rains, PCBs from the paint wash into the river. These are small chemical compounds that don't break down naturally in the environment, and cleaning them up is an expensive challenge for the city of Spokane. City utilities spokesperson Marlene Feist says Spokane is working toward meeting a state water quality standard for PCBs of 170 parts per quadrillion. "These chemicals are problematic in very minute quantities; that's the challenge," says Feist. "But the idea that they could be broken down and removed from the environment is compelling." To clean up the Spokane River, Feist says that by 2021, the city will have spent more than $300 million on projects intended to prevent PCBs and other pollutants from entering the waterway. But she says that PCBs the city prevents from entering the river just end up moving to a landfill. Montez says that's an imperfect solution, because PCBs can leach out of landfills or volatilize and become airborne. Scott Kellogg, educational director for the Albany, New York-based Radix Ecological Sustainability Center, says that other cities handle PCBs and other pollutants with the same "dig-and-dump" approach that sometimes involves expensive dredging of waterways. He says that just moves the problem elsewhere. "It will fulfill environmental regulations," Kellogg says. "But it's highly disruptive to native ecology and doesn't treat soils as the limited resources that they are." Kellogg says that there is a growing interest in bioremediation, using plants and other natural features to address pollution. For instance, cities, including Spokane, are building bioswales, drainage courses that use vegetation to filter out pollutants. He says research shows that mushrooms have potential as a bioremediate, breaking down harmful substances such as pesticides, oil products and PCBs. But using mushrooms to eliminate PCBs will take longer than just digging up and moving polluted soil, says Kellogg, and developers and local governments might be reluctant to adopt such a novel approach. "There's a lot of things that are just unknowns," says Montez, who points out that fungi are sensitive to heat, humidity, bad soil and competing species. "It's going to be a really interesting journey seeing how these fungi behave in these situations." Montez says she hasn't found any other city that's tried to use fungi to clean up pollution problems, and that's why the experiment will proceed slowly. The first phase will involve placing fungi in petri dishes spiked with PCBs, just to see how they react. After two to three weeks, they will be sent to labs to be tested to see if they've reduced PCBs, she says. If that goes well, Montez says the next phase will involve mixing in fungi cultures with PCB-contaminated sludge and oils provided by the city to see if that has an effect. If that works, it could potentially be applied on an industrial scale.